Breaking my habit of sewing using the cheapest of el cheapo fabric from Spotlight, I have finally made something in a better quality fabric that I brought ages ago from Hobbysew. Its a Moda fabric – Bliss by Bonnie and Camile for Moda pattern 55026. I decided to make it up yesterday using Simplicity 2588, the flared skirt option, and instead of making a dress (not enough fabric), cutting the belt piece and using it as a waistband instead. I refered to another skirt pattern with a waistband to get guidance on the whole right over left/left over right confusion I usually have when sewing closures. The waistband is 2″ wide and has a real “belt” look. I interfaced both front and back pieces to make it more sturdy. Firstly, this fabric was a dream to sew. 100% cotton, but not prone to creasing, beautiful feel and drape, worth every penny. I would normally never use something so patterned for a skirt, I usually prefer solid colour bottoms and patterned tops so this is a bit of a departure for me. In honour of Me-Made-May 2012 I decided to lash out. The pattern was so simple, I love love love the pockets, and concur with other bloggers I have read: once you realise how amazing pockets are you will try to put them in everything. My other first was pattern matching the back seam and zipper. I managed to get it almost perfect for the first time, so that was my big thrill for the project. 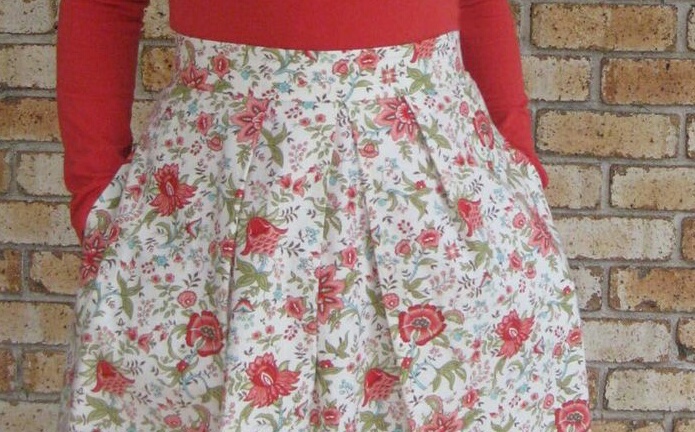 I plan to make a few simple jersey tops to wear tucked in with this skirt.